Hand printing linocut with a spoon is something I teach in my workshops but I have never used this technique for anything bigger than a cereal box. It requires patience and effort, as you have to burnish the paper hard to get it to take the ink fully. 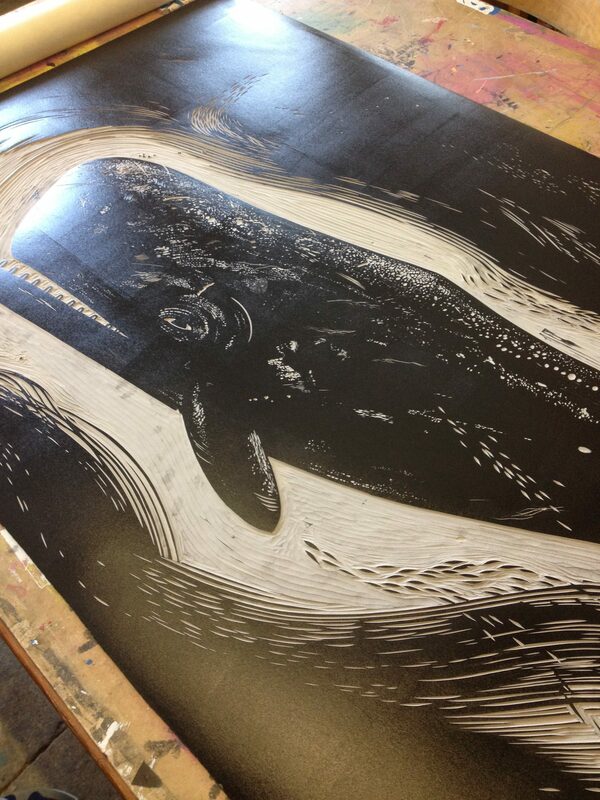 Well, I needed the patience of a saint this week when I hand printed my giant whale linocut. It took me four hours (with breaks for lunch and instagram) and two days later my arm is still sore. 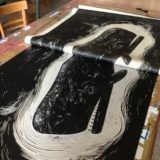 I made the whale linocut for Ditchling Museum’s Big Steam Print event this weekend. In stark contrast to the labour intensive spoon printing, this time a steam roller will be employed. You may ask why I don’t just use my printing press. The answer is that the whale measures 6ft x 3ft (180 x 90cm) and my press is only a third of that size. Before the block gets run over I wanted to take a few proofs, but in the end I only had time for one. 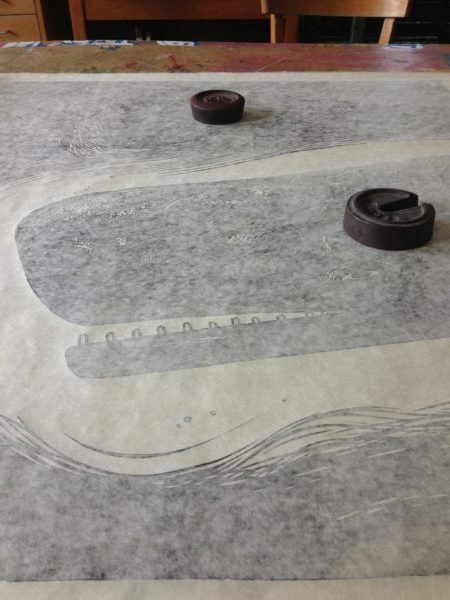 Below are some photos of the hand printing linocut process. I used Caligo ink, which I use for all my work, and is oil-based but washes up in water. I was worried the ink would start to dry before I finished but it was fine. 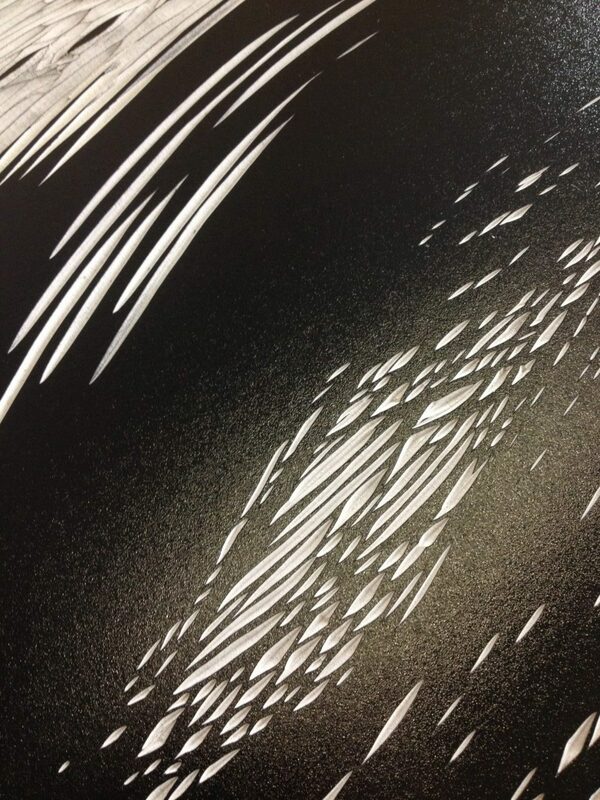 The paper is an ivory coloured Japanese washi called kozuke which is machine made and 70% kozo (mulberry fibres). It comes on a metre wide roll from Shepherds in London. I realised two minutes into printing that I was using the wrong side of the paper, but decided to continue. The smoother surface on the other side might have take the ink a bit better, but in the end I was happy with the textures created. If you’re in Brighton tomorrow, come and say hi and see the steam roller in action. I’ll be there printing this beast between 4.30-5.20pm. This gives you an idea of the scale as the paper is peeled back. Maybe a bigger spoon? (Actually a good ball-bearing baren would have been probably faster, but the contrast between spoon–and steamroller was worth documenting and doing at least once. Can you say what wood you use for the woodcuts you make? The cuts are so neat and accurate, I can see so much skill. The print is really cool. Hahaha this brings back memories! I’ve been making prints since I was 16 but only had access to a press in the last year or two. Before then my dad would always help me burnish the back of the paper with the back of a dessert spoon. In fact when he’d been calling the silverware burnishing spoons for so long that when I was very little I genuinely thought this was something in everyone’s cutlery draw that just sat alongside the soup spoons and teaspoons – I was just never sure what dish it was used for! I do all my printing w a “10-finger” press. I have never used a press but would like to try. What I love about your post is that even an expert can start printing and realize the paper side is wrong. So much to remember. I also want to try these oil-based paints that wash off in water. What kind of printer do you use in your studio? I’m starting to research them for home use (small studio space) and I’m interested if you have any advice. Your blog is wonderful! What small press would you recommend for printing lino cuts at home (i.e. less than £200?) I make my own Christmas card each year and would like next year to save my aching muscles from all that spoon burnishing. Do you ever add any tack reducer to the Caligo inks? 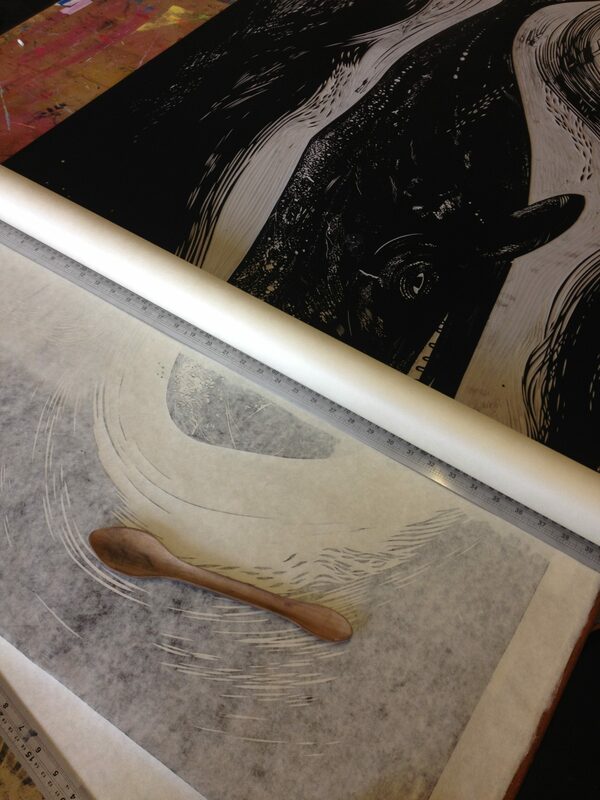 I’m new to the print world have have become aware very early on the patience it takes when using the wooden spoon. I had a question. How would you transfer your key image to multiple blocks for consistent registration using this method of printing. Any tips and tricks are appreciated! 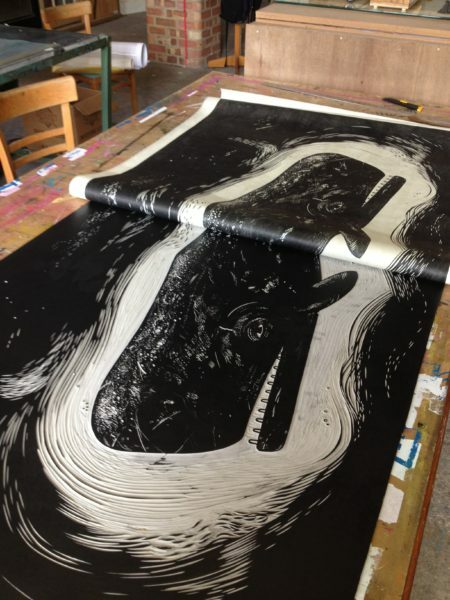 « Big Steam Print event – Biggest linocut ever!